I made a little memory box yesterday......for two reasons. Alysn at The Beetroot Tree asked me to make one for a forthcoming exhibition at her gallery on the theme of Memory. 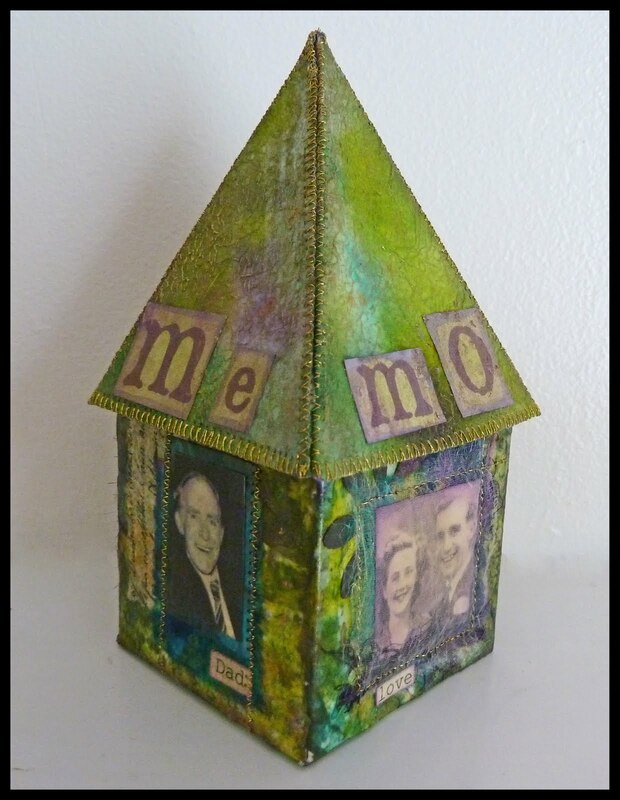 In support of the Alzheimer's Society we will be inviting you to purchase a memory box pack online to create you own work for display alongside the exhibition." I decided to make it for my Dad, who died last year after suffering from dementia for approx 3 years. Inside the box are a selection of small photos plus a copy of my 'letter to Dad' which I read out at his funeral. If you'd like to join in, you can read more about the challenge here and also on Alysn's blog here. There's a £3 charge to help raise funds for the Alzheimers Society. What a lovely box and look at that bread....mmmmmmm....and of course my favorite cyber kitty,,,Sir Peachy...ahhhhh toooo cute! Your memory box is beautiful and a lovely way of commemorating your father. The bread and cakes look yummy and the special cream sounds great. I rather like the simplicity of those labels. Love the Peachy pics and all that gorgeous artwork in the background. Beautiful memory box remembering your Father.It looks splendid in your colours. What a lovely idea to raise funds for such a debilitating condition. Great memory box! Lovely photos of your ginger cat! What a lovely post, the box is very beautiful. I love the photo of Peachy asleep sitting up! What a beautiful tribute to your Dad! I will be ordering the template too. Peachey looks very comfortable, if a little wary and your art wall looks fantastic! What a great way to enjoy all that art. The memory box about your father is so heartfelt and so touching. What a particularly good thing to do at this time of year. I love the colors and the images you used, as well as the stitching all round. It really is a beautiful box! Your have been busy! The food looks yummy, and your cream sound really helpful. Where would I buy your cream? Peachy is so adorable! And I love the way you have displayed art work on the wall behind. What a beautiful way to remember your father. The bread looks yummy! I would be in trouble if I had a bread maker...I'd want to eat a whole loaf! Aw Peachy...your cute little face always makes me smile. Happy Weekend! Ohhh that Peachy, he such a handsome boy! Linda your Memory Box is beautiful, and I love all of the memories you have popped inside. What a great way of raising money for Alzheimers. YUM.... I want to eat that bread!!! I'm sorry, Peaches stole the post this time! Your memory box is lovely (in your 'signature' colours too), what a wonderful idea. What a beautiful and original work! I admire the colors! 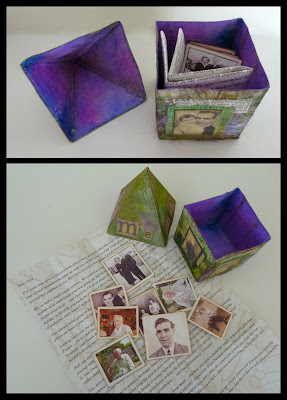 What lovely box - a beautfiul way to preserve memories. Of course I cannot resist Peachy looking so cute and love your display! That is a beautiful and very special box Linda. I can vouch for the bread; it not only looks great but is also very delicious. Save me a fairy cake for Tuesday!! Hope he didn't fall off while he was sleeping. I locve Peachy's backdrop. Those little pieces on the wall look lovely. Lovely tribute to your father. I like the format. Your loaf of bread is making me hungry! Peachy is such a dear, and I love how you have your ATC's and things displayed. They look great. I love your Memory Box Linda - such a wonderful tribute to yur Dad to today. Can I come to tea on Tuesday too! Your memory box is beautiful and its a nice idea . What beautiful art do you have on the wall ! Ha ha, and my husband do baking also bread when he is in the mood for that . What a lovely idea, I so admire you reading out your letter. Fabulous pieces behind your Peachy. I hope you shared your lovely memory box with your mom, Linda. You had a very busy and productive day! That Peachy is too cute; isn't it interesting the way cats follow you around, just watching and then napping? Yes you have been very productive havn't you? Since when did you start making cream? This is news to me :) Is there no end to your talents, I think you could do anything Linda. The memory box in honour of your dad is spectacular, and soooo you, love, love, love it, and so glad you always have Peachy to keep you company, the room feels empty when our pets are not there doesn't it? Your bread, wow, looks great , you rock girl ! What a loving and reflective work of art. I'm glad you could cherish the memory of your father through art. Beautiful work. Just like a cat! ;o) Very intrigued by the mixed media items on the wall behind him. Such a precious post and a sweet remembrance dear Linda! Really lovely on so many levels! You maker of wonderful things you...as I was reading the bits about your cream (YOU MAKE CREAMS TOO!!! sorry got excited!) I came to the part about rubbing on your stomach...hoping it was a miracle cream to help flatten the tummy perhaps ;) A girl can dream! BIG hugs to you dear one! Emma's blog and there is so much to inspire e.g. your combined fabric book. I see that you to love pre-raphaelite art and have used it in your fabric book. Your memory box is really neat. Absolutely beautiful memory box what an amazingly wonderful memento, you brave girl for making it! You were busy weren't you. Far busier than Peachy boy, love all the artwork on the wall such gorgeous eye candy to inspire you and make you smile.